Bryn’s never been a regular sort of small town Welsh girl. She’s intrigued with ancient manuscripts, scrolls, and arcane secret books. When Penrith University library acquires the mysterious N800 texts, being junior librarian gives her quick access to the texts and she starts to spend all her spare time studying their strange and frightening message. The very secretive Luxent is also interested in the N800. Daveithe draws Bryn into the underground group as they fear that One Earth Dynamic, the global agency that tracks all human life, has insidious ties to an ancient evil written about in the N800 and they need her help to expose it. Terrifying secrets about One Earth Dynamic are brought to light when gorgeous OED fugitive, Curran Reithe, runs to Luxent for sanctuary. And Bryn’s strange ability to throw condensed light becomes a weapon in a growing struggle for supremacy between natural earth magic and other worldly forces as new truths emerge. But Bryn’s rising emotions for Curran and learning the horrifying reality of the OED can only lead down one road, and that goes straight into an ancient and evil web. 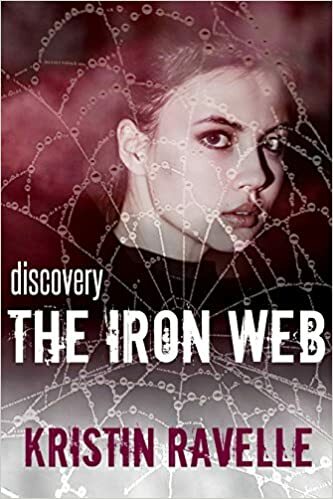 The Iron Web- Discovery is a fast paced dystopian novel. It is quite different to anything I've read before and I really enjoyed it. It also has some paranormal aspects to it in relation to Bryn's special abilities. Other characters also have the ability to communicate with each other through trees. Bryn is an intelligent and independent young woman who isn't afraid to question the role of the OED in her life and she braves the consequences for refusing to register with them on her next birthday. She gets embroiled with an underground rebel group who oppose the OED. They discover that Bryn has a talent of projecting her inner light which can be used as a weapon and as a cure for a virus that is spreading. Available from Amazon and it's free with a Kindle Unlimited subscription.